It was 5 years ago that two brothers, Bibhuti and Nabin Aryal, embarked upon what seemed like — at the time — a simple idea. Knowing that a family’s economic condition was one of the key reasons why many girls in rural areas of Nepal were missing out on education, they wanted to help a few families by providing economic support so that money alone does not keep girls out of school. If they could help a few girls this way, they felt it would be a worthwhile cause. The reasons to support girls’ education are many, and the motivation for the brothers to do this was based partly in Nabin’s experience in the field of Developmental Economics where he has seen similar issues in many parts of the world and based partly in Bibhuti’s desire to make a positive impact in the community that he was from, but had been away for more than 2 decades. 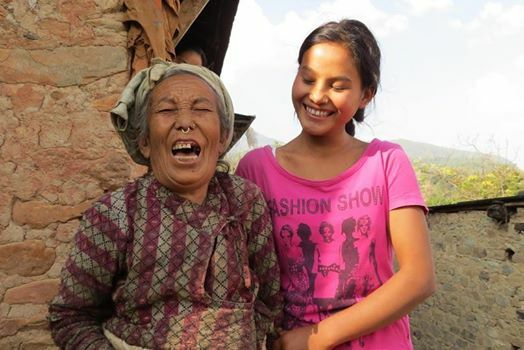 Along with their personal experience and motivations, the inspiration of their great grandmother, Rukmini (the namesake of the organization) and Laxmi Aryal, their mother and the first girl in her family and village to attend school shaped and guided their vision. Lastly, the impact of education within their own family crystallized the idea that education is the cornerstone of empowerment. The goals were modest at the beginning — keep girls in school till they graduate from high school, and by attending school we will most likely be preventing early marriage. We were going to focus on girls entering high school, which in Nepal meant grades 8 through 10 because that was when most girls were likely to drop out and potentially be a target for child marriage. We wanted the girls to graduate and to do well in school of course, but if the only thing we were able to achieve was the prevention of one child marriage because these girls were in a classroom, it would have been a victory. Even though we set modest goals, we also wanted to learn from our programs, from the scholars, our team members, and the community so that we could provide additional support to make sure these girls were as successful as possible in school. We held meetings with the girls to see how they were doing, and we visited homes to check on them. We organized some meetings between parents and teachers as well. 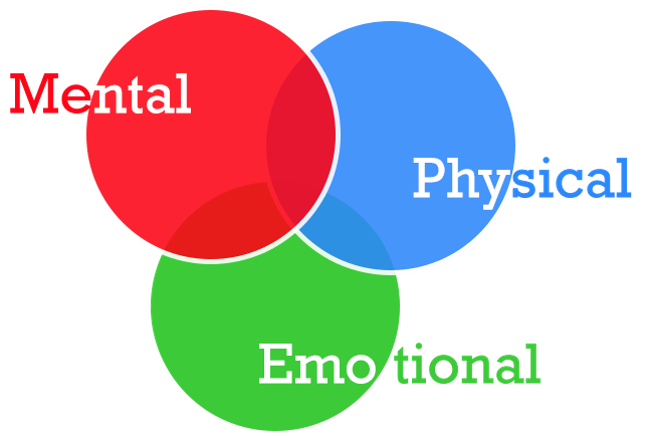 Within our organization, we also implemented a flat hierarchy promoting feedback and input from all team members. In Nepal, there is typically a very rigid hierarchy in organizations and people do not question those in “leadership”positions, but we wanted to be completely different from that. We knew that the only way we would empower these girls is if we empowered our team to challenge each other in a productive manner. One thing we learned right away was that it was not very common for the schools (or anybody for that matter) to pay this much attention to the girls’ education. By simply showing an interest in their education and meeting with them, the girls were starting to feel more comfortable in school. Lesson #1: Doing something for the community without the community’s input is working against the community. The first big challenge we had to overcome was, despite knowing that we wanted to focus on girls’ education, who exactly were we going to support? As one of the poorest countries, and by focusing on rural areas in an area outside of the capital of Kathmandu, there were certainly many in need, thus determining the families to support was a challenge. This predicament led to our first (and probably most important) lesson learned, which was that the decisions we would make and the things we tried to would have to start with the involvement of the community. One of the first activities of the foundation was the creation of a Scholar Selection Committee, which was made up of local leaders: teachers and prominent community leaders. This committee has since evolved to include more community members, including female leaders. By doing so, we didn’t have to make the determination of who to support. The community knew of the individual situation of families in the area, and from there we were able to review candidates and determine support. Within a year of our programs, we also learned (through feedback from the community, but also through observation) that we had to rethink our initial idea of focusing only on girls entering high school because they were the most at-risk. While this was still true, what we learned was that there were many more girls who never even made it to that point due to the financial condition of their families, and even those that did had developed a mindset that their life had a very low ceiling. Based on the feedback from the community, we quickly decided that we were going to support girls of all grade levels based on their family’s level of need. This caused us to have to increase operational capacity as well as our budget, but it has proved to be a great benefit to our programs, and most importantly the girls because the younger scholars have started to set higher goals for themselves based on being involved in our programs at a younger age. Lesson #2: “Scholarships” alone are not enough to empower girls. You have to address the emotional needs of the girls and empower female leaders around them to provide support. Knowing that we were working with the girls from the poorest and most disadvantaged backgrounds, we knew that access to school via the scholarship alone was not going to be enough. We included some monitoring and supportive services by assigning older females called Didis, which means elder sisters in Nepali, to act as mentors for the scholars. At the time, we were not sure how valuable this service would be, but based on feedback from the scholars, this seems to be the key ingredient to our success. Our mentoring program allowed our girls to have someone to serve as an inspiration to them while also being a confidant to discuss their schools and personal issues. Mentoring, as a concept, is fairly new in Nepal. While you may have older family members who provide guidance, receiving guidance from people outside of the family is not something that is normally done. Even the name of the program, Didi, was our way of helping to address that concern, and was also our attempt to replicate some parts of the very successful mentoring model of Big Brothers Big Sisters in the US. Once implemented, we were very pleased to learn that the girls responded well to being able to speak to other (older) girls about their academic and personal challenges. We had to do some training and coaching of the mentors to ensure that they knew the signs of trouble to look for and also on how to handle sensitive issues. The Didi Program has been such a success that some of the scholars who have since graduated are now coming back to be Didis (mentors) to the younger scholars. Empowering these young females to be the role models and guides for the scholars has been one of the key reasons for the foundation’s success. Over the years, we have expanded this program to not only include the regular monitoring and home visits by the staff mentors, but also to include monthly Didi Programs where we invite prominent and successful females to come to talk with the girls about their lives and their journeys. What this has done is show the girls that there is a life besides being a young wife and mother, and that it is possible for females to succeed in different fields. We are fortunate to have been able to invite prominent Nepali females like, Ms. Pushpa Basnet (CNN Hero of the year 2012). Meeting individuals like these in person has opened up the eyes, minds, and indeed the world for these scholars. Lesson #3: Just like our scholars, we have had to learn, adjust, and repeat. While we had many successes to feel proud of, we also encountered a few failures that left us disheartened. When one of our scholars left the program in 2012 and eloped to get married at a very early age, we felt helpless and blamed ourselves for not being able to prevent that situation. However, with time we had to accept that there are situations where we have little influence in the ultimate decisions of the girls and their families. However, this incident did teach us that we needed to do more outreach with parents, teachers, and community members as they may get more advanced warning of potential issues, or in the case of parents may be the source of pressure for early marriage. By implementing this system, we were able to identify situations like a girl having difficulty coping with the loss of her parents and with her extended family applying pressure to get her married. In another case, a girl was being pressured to get married early by her father and to focus on household work rather than school despite her desire to continue school. In each case, our connection with local teachers, and outreach with parents and guardians prevented two imminent cases of child marriage. We consider educating parents and community members just as important as educating girls because without their support, it is very difficult for the girls to succeed in school. Lesson #4: The best laid plans of mice and men often go awry. As an organization, we felt that we had been quite successful in the first few years. We were laying a good “foundation” down for our organization, and were being flexible enough to learn from the community and adjust as needed. We also focused a lot of our efforts in capacity building with our Nepal Team, and improved the team’s skills like accounting, time management, and planning. It was in the planning stages of 2015 when we faced the single biggest challenge of the last 5 years when Nepal was hit by two devastating earthquakes that left the country paralyzed. Those natural disasters claimed over 8,000 lives and destroyed more than 250,000 homes in Nepal, causing many families to have to live on the streets. 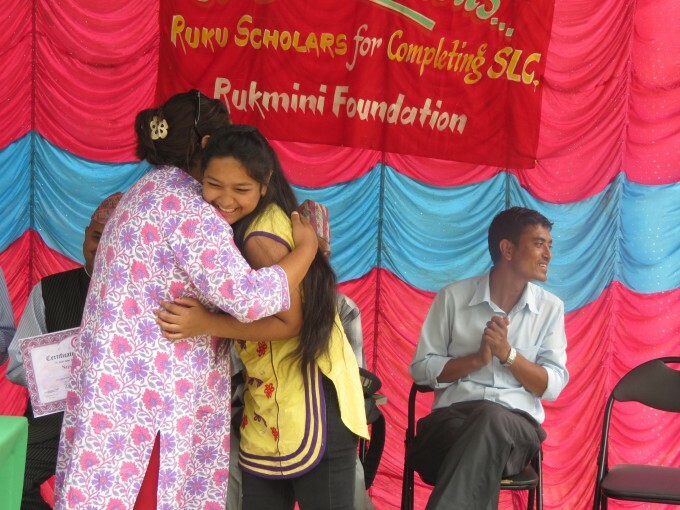 The resulting humanitarian crisis has overwhelmed the Government of Nepal, which was unable to provide timely relief to all areas in Nepal, including the villages where Rukmini Foundation serves. We had to make a decision as an organization what our response would be to this national disaster. Although Rukmini’s core mission is not in disaster relief – it soon became apparent that in order to lower preventable deaths, people needed to have access to basic necessities. We mobilized our entire Nepal Team, and focused a majority of our financial efforts to provide basic necessities and services. 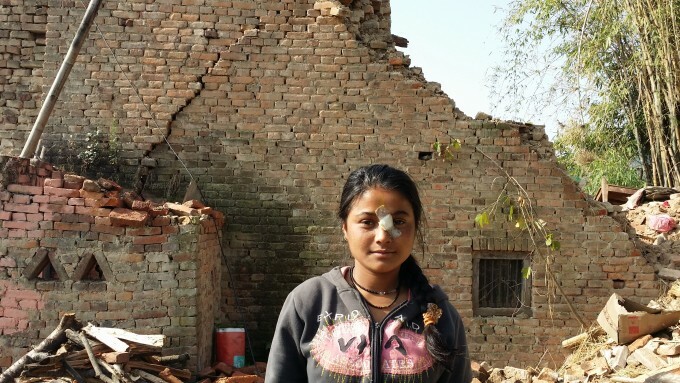 After the earthquake, our staff went to visit Rukmini scholars, their families, and the surrounding communities to inspect the damages and the living conditions. We were careful to make sure that we didn’t limit these services to just our scholars and their families. Despite having limited funds, we were able to provide valuable services to not only our scholars and their families, but also to their hardest hit neighbors. 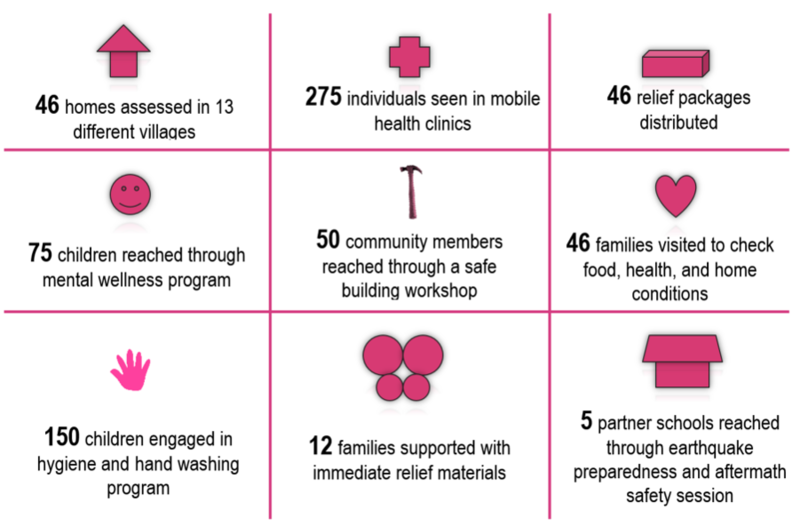 Our relief efforts included distributing basic necessities, providing health care through mobile health camps, building temporary shelters, and providing mental health support for traumatized survivors. Despite being a small organization, we learned to adapt and shift our focus to the needs of the people and the areas we were serving. By addressing the critical needs of the families, at a time they needed it the most, it has further enhanced our reputation with the community, which in turn allows us to deliver even more quality programs, which empowers through education. Lesson #5: Just because these girls come from modest backgrounds doesn’t mean we set modest goals for them. These girls have survived earthquakes, crippling poverty, and generations of discrimination based on their ethnicity, gender, and poverty. They deserve our admiration, respect, and support. Just because they come from humble backgrounds does not mean that we do not try our best to provide the highest quality education. Even though we started with the idea of just keeping girls in school to prevent early marriage, we have seen such progress from the girls in terms of their academic achievement as well as their personal transformation as girls who can speak and perform in front of audiences. With their horizons broadened, we need to continue to expand and improve the services and programs we provide. With that in mind, we have always worked to provide new and innovative programs for these girls. Fortunately for us, for one of these innovative programs, we were able to leverage a partnership with our friends at LitWorld by implementing LitClub Nepal. We started with 1 LitClub 4 years ago, and now have expanded to 6 LitClubs across Nepal providing after-school activities to nearly 100 girls. This program has become not only a great outlet for these girls, but also an incubator for female leaders of the foundation. 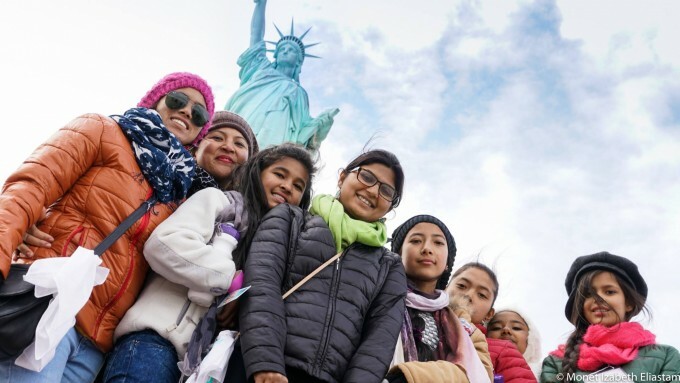 This symbiotic relationship continues to grow, and culminated in March 2016 with a historic visit to New York City by 7 of our Rukmini-affiliated girls and leaders to participate in a HerStory Summit organized by LitWorld and Global GLOW. Besides LitClub Nepal, we have been focusing on ways to improve the quality of education, especially with our partner school, Shikharapur where we have placed a special emphasis on English instruction. The language of higher education in Nepal is mostly in English so it becomes a barrier to achieving higher education if you do not have English. We are working with some teachers in Nepal who are connected with teachers in the United States to learn from each other and share ideas. What the teachers learn from these sessions are being applied in the classrooms. Along with these ideas, we are also looking to improve the way classes like Science is taught where students get to experiment instead of just learning through memorization. We are also looking to do more Project Based Learning, where students learn through more hands-on activities. As always, we keep listening to our community and the students, and we heard loud and clear that the arts and sports were very important to them. With that in mind, we have been slowly incorporating an arts program called, Kalaa where students get to learn about music and dance, but also get to sing and dance…and enjoy being students, which is so critical to their development. We are also introducing activities like organized sports, which teaches the girls not only to be mentally strong, but physically strong as well. It also teaches the important concept of teamwork, which is often downplayed in Nepali education, in favor for competition and individual success. We hope that we are developing future leaders through our programs, so learning how to work through adversity and working together is key to empowerment. A report that summarizes our past 5 years at a very high level can be downloaded here. Looking ahead, we know we still have a long way to go. A country that still lives by patriarchal values and doesn’t see the importance in giving girls the same right as boys, we are daring to change the social construction. We will continue to live by our vision and empower girls to fulfill their potential and realize their worth. We hope to expand our reach and support our scholars beyond high school. As we focus on getting more girls educated, we also want to aim for a more quality education. We have just completed our new science lab and are aiming to improve English instruction by connecting teachers in the US with teachers in Nepal. We also hope to bring more arts, music, and sports to the lives of our scholars. What started out as a fairly simple idea from two brothers has evolved and grown into a sophisticated organization that is always thinking ahead, but learning from its experiences. What has not changed, and will not change, is our fundamental belief that quality education is a human right and not a privilege and should be available to all despite gender, ethnicity, socioeconomic class, or anything else that differentiates and divides us. In our key lessons learned here, we know that we did not talk about our supporters and partners, but all of this work would not and could not be possible without your support. With 5 years completed and many lessons learned, we look ahead to the future and continue to work towards a day where Quality Education for All become a reality. Just recently, we were proud to inaugurate 3 innovative programs, which will support these girls and all students of our partner school, Shikharapur. A state of the art Science Lab, a Mobile Library that will reach out to communities that cannot access the library themselves, and a Smart Class, which will allow teachers to provide education in a more interactive fashion. Girl Up is an innovative campaign of the United Nations Foundation addressing the needs of adolescent girls in developing countries.